My son Ian has a quirky approach to the world. When he twittered that he’d created the best dessert in the world (or words to that effect), I tweeted that I wanted the recipe. This is what I got. Enjoy! STEP ONE: cut up some bananas and freeze them. Three regular bananas will make enough for two people. Freezing takes about two hours. Take the peel off, because otherwise it will be too hard to remove later. STEP TWO: put the frozen bananas in your blender or food processor. Blend them up. At first, it won’t look like anything, but just keep doing it. Soon, it will suddenly turn into the creamy cold texture you want. Now stop. Don’t over blend it. THAT IS ALL: you can eat right away! It will have the texture of soft serve ice cream. OR: you can put it back in the freezer and let it freeze more, if it’s gotten too melty or you don’t like soft serve. Then it will be more like regular ice cream. Both ways are good! It’s sweet and cold and good. OPTIONAL: add a scoop of peanut butter during blending to make it even better. You could probably also experiment with almond butter. I find this makes for a good texture, but a second ingredient is entirely OPTIONAL because this is one ingredient ice cream. THIS RECIPE DOES NOT HAVE OR NEED: Any added sugar; milk; any animal products at all; ice; any ingredients that can’t be purchased at any grocery store in the land for less than a dollar. You can serve this to tubby children or to lean vegan gluten free athletes: they will all love it. The children may become less tubby, however, so be warned. YOU WILL LIKE IAN’S ONE INGREDIENT ICE CREAM IF: you like sweet cold treats. NUMBER OF DAYS IN A ROW YOU COULD EAT THIS WITHOUT GETTING FAT: as many as you want. It’s just bananas! WILL IAN’S ONE INGREDIENT ICE CREAM CONTRIBUTE TO METABOLIC SYNDROME OR DIABETES? No, it is just a couple of bananas and some optional peanut butter. IS IAN’S ONE INGREDIENT ICE CREAM EXPENSIVE TO MAKE? No, it’s just bananas. HOW DOES THIS WORK? I don’t know. I thought it might be the fat content in bananas, but I looked it up and bananas have less than one half gram of fat each in them, so that doesn’t seem right. Ask Alton Brown if you really care! I do not understand the science of my invention; I am simply its sole and exclusive inventor (Ian’s One Ingredient Ice Cream is patent pending). DOES THIS JUST TASTE LIKE BANANA PUREE? No, it doesn’t, and I don’t know why not. It really does seem like this should taste like baby food but it does not. It tastes like ice cream. It’s very sweet. I made three bananas’ worth and almost couldn’t finish it because it felt like eating candy. Then I remembered that Ian’s One Ingredient Ice Cream has no added sugar, so I ate it all up. The next morning, I weighed in at my lowest weight in years. True story. ANY OTHER TIPS? 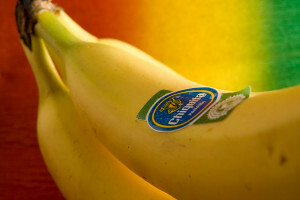 The bananas you use should be ripe. In fact, a little bit overripe is fine and possibly even better. But definitely not green; I don’t think that will blend properly. If you use under-ripe bananas and do not like the results, that is not the fault of Ian or his recipe for One Ingredient Ice Cream. WOULD THIS BE GOOD TO SERVE IN HOSPITALS? Yes. Bananas do not upset the stomach, and are easy to digest; plus, hospital patients are sad and need sweet desserts to cheer them up. If you are a hospital administrator interested in licensing Ian’s One Ingredient Ice Cream for deployment en masse, please contact Ian Samuel (ian@iansamuel.com) for a term sheet. THANK YOU, IAN, FOR INVENTING THIS: No problem. Nice! I slice up bananas and freeze them and use them in smoothies instead of frozen yoghurt or icecream. And yep, goes all yummy and creamy so you’d swear there was something else in them. Hadn’t thought of trying them on their own. It never occurred to me to do this. I love bananas, and think I might try experimenting with almond butter, which I also really like. Chopped up frozen bananas? That’s it? Thanks Martha. Jarvis, you might be taking the post a bit too seriously. the universe we live in. One on philosophical context cannot prove the existence of God nor can one prove there is none. Its a argument is spurious on both sides. When you think about it both the Godly and Atheists will suffer equally and your human masters can only put ridicule on your ideas- whatever the view.Peoples lives go on economic collapse or not. It should be a last resort. Do you have a spam issue on this website; I also am a blogger, and I was wondering your situation; many of us have developed some nice practices and we are looking to trade techniques with others, why not shoot me an e-mail if interested. Youre so cool! I dont suppose Ive read anything like this before. So nice to search out any individual with some original thoughts on this subject. realy thanks for beginning this up. this web site is one thing that’s wanted on the net, somebody with a bit of originality. helpful job for bringing something new to the internet!